Did I have you at pumpkin or chocolate? Honestly, chocolate makes almost everything taste good, but it make any bad day better. I definitely had a case of the Mondays yesterday, shhh don't tell my boss. So naturally what would any pregnant woman do? Duh, bake cookies! Side note: if it was a workout night I would have workout and then baked cookies! Lucky me tomorrow is a double day so I'm not worried about any amount of calories from said cookie. Winning! Ok, so more about the cookies. I wish I had an old family recipe to share, but alas I don't. Instead I called up my friend Pinterest via the internet and asked her for the best pumpkin chocolate chip cookie recipe. 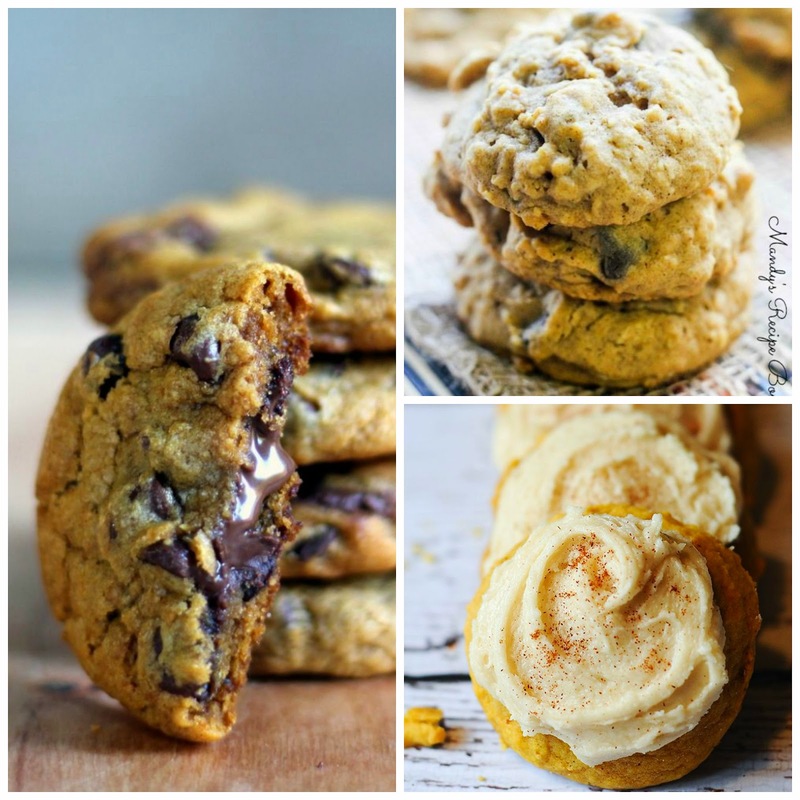 Oh boy, she had a few cookie recipes to share.These are definitely on deck -- Brown Butter Nutella-Stuffed Pumpkin Chocolate Chip Cookies, Oatmeal Chocolate Chip Pumpkin Cookies and Melt-in-your-mouth pumpkin cookies! Since I didn't feel like going to the store I had to work with ingredients on hand, but trust me these classic pumpkin chocolate chips cookies were perfect! The best part -- I was able to use my new freestanding slide-in oven range!! Worked like a dream. Whisk melted butter, brown sugar, and granulated sugar together until no lumps remain. Mix in the vanilla and pumpkin until smooth and set aside. In another bowl mix flour, salt, baking powder, baking soda, cinnamon, nutmeg, allspice, and pumpkin spice. Using a stand mixer combine flour and pumpkin mixture. The dough will be very soft. Stir in chocolate chips. Cover the dough and chill for 30 minutes. This step is mandatory. While dough is chilling preheat the oven to 350 degrees. Line two large baking sheets with parchment paper. Drop tablespoon sized balls on cookie sheet -- flatted the bottom slightly. Bake for 8-10 minutes. The cookies will look very soft and under baked. Cooking them any longer may dry them out. Let them cool for 10 minutes before serving. Enjoy with a glass of soy, almond or regular milk! Linking up with Lisa love John! Giveaway update: Thank you to everyone who entered the Hamilton Beach Giveaway! Congratulations to Natalie -- her favorite slow cooker meal is seafood chowder with lump crabmeat and shrimp. Happy cooking. I'm drooling and definitely need to make these. 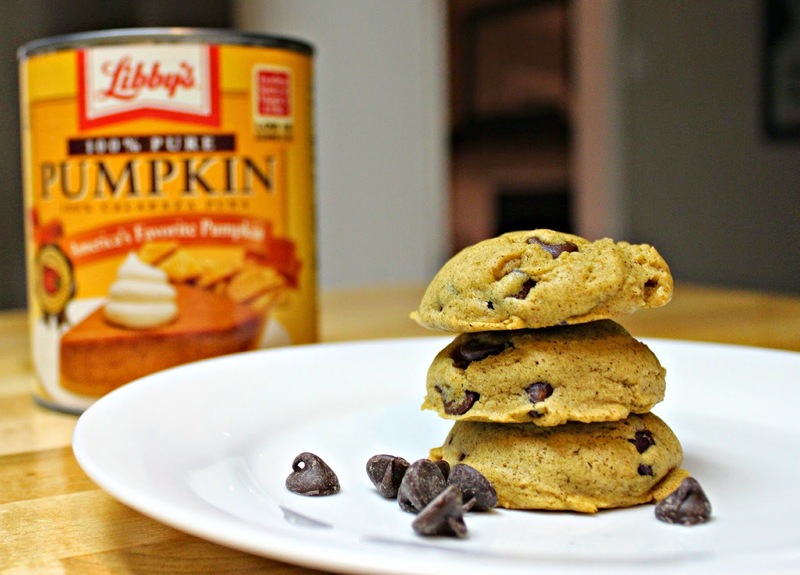 I love chocolate chip cookies and I can only imagine how good the pumpkin is with them! Thanks for linking up with us! !